Most of the metabolic and psychiatric disorders are triggered by delayed sleep and other sleep-related problems, according to renowned biologist and geneticist Michael Warren Young. VISAKHAPATNAM: Most of the metabolic and psychiatric disorders are triggered by delayed sleep and other sleep-related problems, according to renowned biologist and geneticist Michael Warren Young. 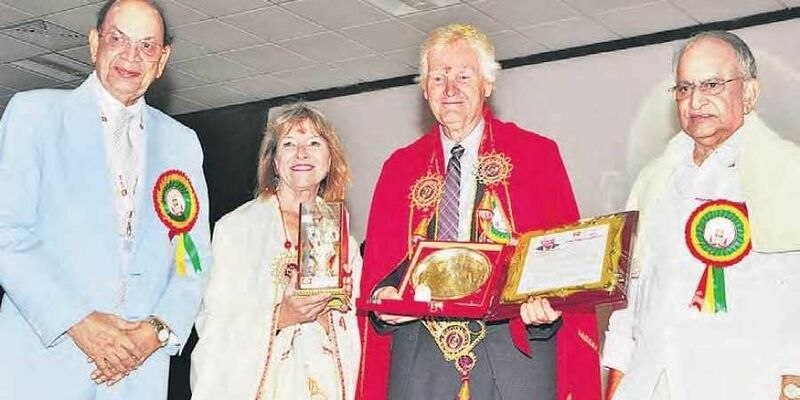 Chancellor Prof K Ramakrishna Rao and others honoured Young and his wife. The award comprises a citation, plaque and cheque for Rs 10 lakh. It is given every year to distinguished persons for their exemplary service to society as per the suggestion of GITAM Founder-President MVVS Murthi from interest accrued on Rs 3 crore donated by him to the corpus fund. Michael Warren Young, who isolated a gene which controls the normal daily biological rhythm, explained his research findings, in his endowment lecture to the students. Young said that life on earth is adapted to the rotation of our planet and it is found that living organisms, including humans, have an internal biological clock that helps them anticipate and adapt to the regular rhythm of the day. Young said that his laboratory is studying a syndrome called Delayed Sleep Phase Disorder (DSPD). His team is focussing on a single family with several members displaying DSPD. He said that DSPD is affecting about 5 per cent of the US population from clinical studies. He said that they found the presence of Cryptochrome mutation in DSPD individuals. He said using fruit flies as a model organism, his team isolated a gene that regulates the normal daily biological rhythm. They showed that this gene encodes a protein that accumulates in the cell during the night, and is then degraded during the day. Subsequently, they identified additional protein components of this machinery, exposing the mechanism governing the self-sustaining clockwork inside the cell. “We now recognise that biological clocks function on the same principles in cells of other multi-cellular organisms, including humans,” he added. Young said that large proportions of human genes are regulated by the biological clock and, consequently, a carefully calibrated circadian rhythm adapts physiology to different phases of the day. He said the seminal circadian biology has developed into a vast and highly dynamic research field with implications on public health. GITAM Founder-President MVVS Murthi, expressing happiness over 38 years of GITAM’s journey, said the university still has a lot to learn from other old universities in the State. GITAM is honoured to present the Foundation Day award to Young and his presence on the campus would definitely inspire research scholars as well as students. GITAM Chancellor K Ramakrishna Rao observed that true greatness of an educational institution consists in its achieving excellence in quality and standards of teaching, advancements in research, innovation and application of knowledge. GITAM Vice-Chancellor MS Prasada Rao said that GITAM is one of the very few multi-campus, multi-faculty universities accredited with “A+” grade. He also announced that MHRD/UGC recently graded GITAM as “Category-I University” and granted “graded autonomy” under UGC Regulations-2018. The university felicitated the teaching and non-teaching staff during the celebrations. GITAM President MVVS Murthi presented the Best Teacher Award to R Gyana Prasuna (Microbiology), PVY Jayasree, P Trinadha Rao, Maju Jose (English), Best Supporting Staff Awards to K Chandra Sekhar (Sr. Assistant), A Narasinga Rao (Technical Assistant), K Govindarajulu (Attendant), Outstanding Student Speaker Awards to A Annapurna, Fathima Zohra and Jagruthi Jaiswal. District Collector Pravin Kumar were among those present.